Offering you a complete choice of products which include tensile strength tester. We are offering an excellent quality of Tensile Strength Tester which is a fundamental materials science test in which a sample is subjected to a controlled tension until failure. The results from the test are commonly used to select a material for an application, for quality control, and to predict how a material will react under other types of forces. 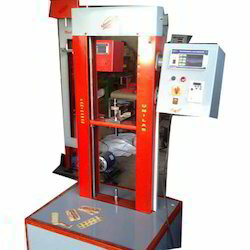 Tensile strength tester is used to determine the tensile strength of the fabric. Speed of the tester: can be 50,100 250 or 300mm per minute as required.